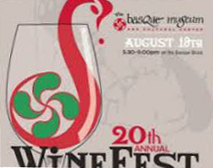 The Basque Museum and Cultural Center in Boise, ID will host its 20th annual Winefest on August 18th from 5:30pm-9pm. The festivities will take place on the Basque Block and your ticket includes the opportunity to try over 100 different wines, enjoy some wonderful pintxos, as well as a chance to win raffle prizes. All proceeds from the event will go to the Basque Museum and Cultural Center, and the Boiseko Ikastola to help both further their mission to "preserve, promote and perpetuate Basque history and culture." For more information or to buy your tickets, click here. The Seattle Euskal Etxea will host its annual Summer Picnic on August 19th at Lake Sammamish State Park - Rotunda Shelter. The day will begin with Mass celebrated by Aita Antton Eguiguren at noon. After mass there will be lunch served at 2pm. The menu includes: lamb, lomo, chorizos, wine and beer to be provided by the club, with side dishes being provided by the membership. This year, each member will receive a t-shirt designed by Francisco Michelena, one for individuals, and family memberships receiving two. For complete information including prices, see their flier. Guests are welcome. If you are on the east coast, you can join the New England Basque Club for their Arrantzale/Marinel Eguna 2017 on August 19th at Dolphin's Cove Marina (421 Seaview Ave, Bridgeport CT 06607). The event will run from 1-7pm and will include appetizers, salad, paella and dessert. Cost of the tickets is $20 for adults and $5 for children 12 and under. There will also be a cash bar. To RSVP please click here. A few good Basque-speaking volunteers are needed to help document Basque tree carvings this weekend, August 18-20th at Monitor Pass. The tour will be from 8am-4:30 on Friday and Saturday and 8:30am-2:30pm on Sunday. A traditional sheepherder dinner will be provided on Saturday night, as a reward for your efforts. If you are interested in helping them out, please email them: aspenluv@gmail.com or call 760-258-6574.